Easter is less than a week away and I wanted to share 3 fun ways to mix up your deviled eggs this year. Everyone loves Grandma’s classic deviled eggs, I definitely do, but wouldn’t it be fun to mix it up this year? 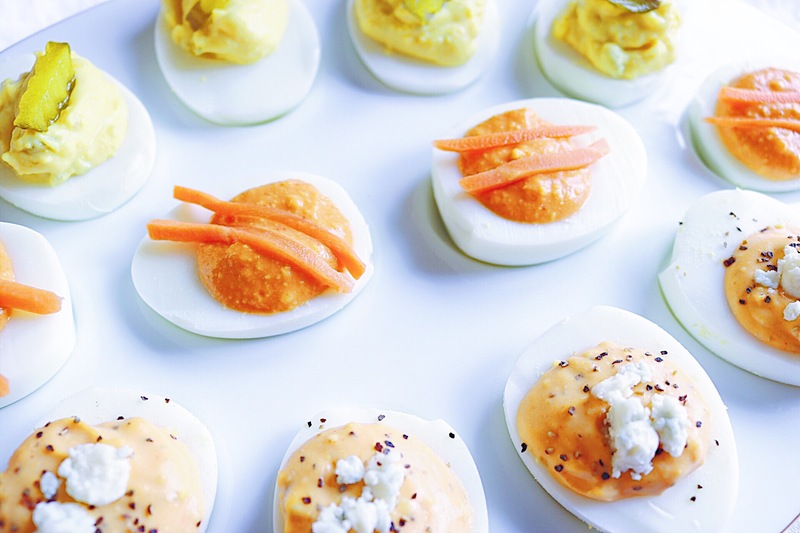 I’m sharing 3 recipes for deviled eggs in this post – first is a take on classic Deviled Egg with Bread & Butter Pickles, the second is Buffalo Blue Cheese Deviled Eggs, and third is sweet and spicy Sriracha Deviled Eggs. All three of these have 6 ingredients or less and are all equally delicious. The hardest part about making one of these recipes is deciding which one to make. Another reason I decided to go all out and share 3 deviled egg recipes was because I had a major life realization about 2 weeks ago! I finallly figured out how to peel hard boiled eggs! All it took was boiling eggs for a snack one night and wanting to make deviled eggs the next day. I was totally dreading peeling the eggs BUT to my surprise the shells peeled right off, no trouble at all! It dawned on me that the eggs were totally chilled from being in the fridge overnight and this was the answer! Before this realization I was soo over trying to make deviled eggs, even though Eric and I love them, it just wasn’t worth the pain to me anymore. Literally I would peel the eggs and half of the egg-white would come right off and I’d be left with half the amount of egg-halves to fill or the ones I managed to salvage would be so flimsy and cratered I couldn’t serve them to anyone. BUT I finalllly figured it out, and you might be thinking, ‘it isn’t hard at all’… now that I’m at this point of egg peeling enlightenment I feel like a huge dummy! I’ve realized patience is a virtue even when it comes to peeling eggs. I now know the most important trick in the book is waiting for the eggs to be fully cooled for them to easily peel. For me it had nothing to do with adding salt or baking soda to the boiling water, using old eggs, an ice bath or whatever other fancy tricks are out there that I tried. It’s about patiently waiting for those eggs to be chilled on the inside so they’re firm enough to hold their shape when you go to peel them! I know.. not a ground breaking realization but it was for me 😉 and now I can finally share the recipes for these 3 kinds of deviled eggs. Little known fact about me, I am obsessed with bread & butter pickles. They’re tangy and sweet and they make the best addition to deviled eggs. These Bread & Butter Pickle Deviled eggs are close to a classic deviled egg but have small bits of chopped up pickles mixed into them along with a splash of the jarred juice to amp up the flavor. These might be my favorite of the 3 types but only because of my pickle obsession. Next up are the Buffalo Blue Cheese Deviled Eggs, these are slightly spicy from the Buffalo Sauce and have blue cheese dressing and crumbles mixed into the filling. They’re a fun way to get that buffalo-wing gameday flavor, and they’d be a great buffalo wing substitute for egg-eating-vegetarians! 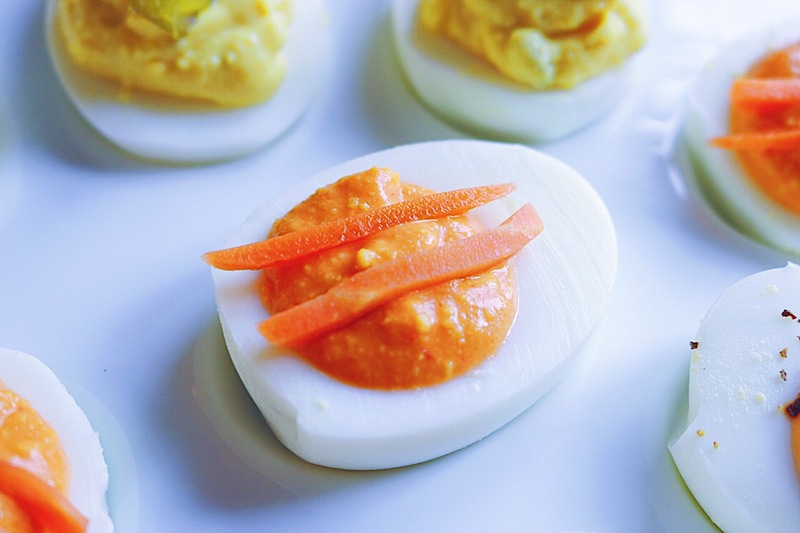 Last up in this trio of deviled eggs are these sweet and spicy Sriracha Deviled Eggs. If you love Sriracha you’ll love these! The filling has a good kick without being overly spicy – they can be enjoyed by many. The spice is mellowed out with brown sugar and mayonnaise and they’re topped with carrot sticks for a little crunch. These are a great combination if you’re wanting to mix it up without buying random ingredients you won’t use again because who doesn’t have a little brown sugar and Sriracha in their kitchen? 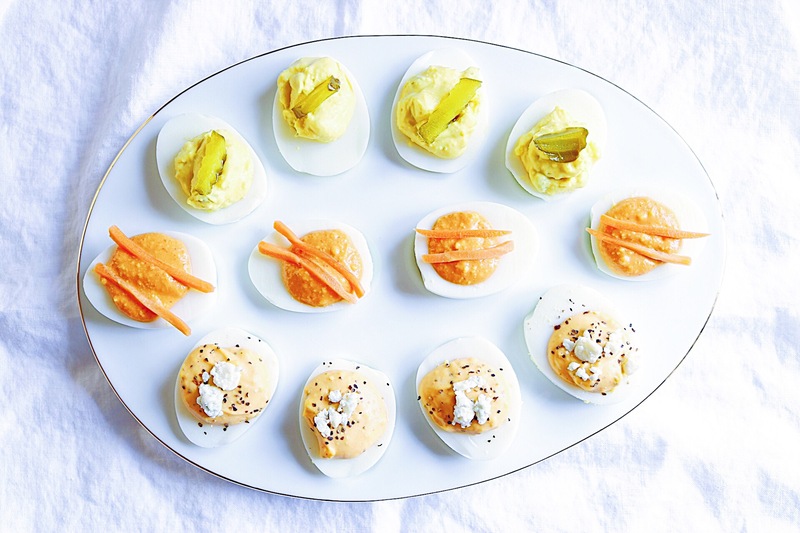 If you’re in charge of making deviled eggs this Easter I hope you give one of these recipes a try. I know I’ll be making at least one of these recipes but like I said deciding which type will be the hardest part of making them! In a mixing bowl combine the egg yolks, mayonnaise, pickle juice, and yellow mustard – mix together until fully combined. Stir in the chopped pickles. Add a pinch of salt to taste. Fill each egg white half with a spoonful of the mixture and garnish with a small piece of bread & butter pickle. Chill until it’s time to serve. -For a smooth deviled egg filling – mash the boiled egg yolks in a bowl by themselves into a fine crumble before adding any additional ingredients. A fun take on the Buffalo and Blue Cheese combination. In a mixing bowl combine the egg yolks, mayonnaise, blue cheese dressing, buffalo wing sauce and black pepper – mix together until fully combined. Stir in the blue cheese crumbles. Add a pinch of salt to taste. Fill each egg white half with a spoonful of the mixture and garnish with crumbled blue cheese and black pepper. Chill until it’s time to serve. 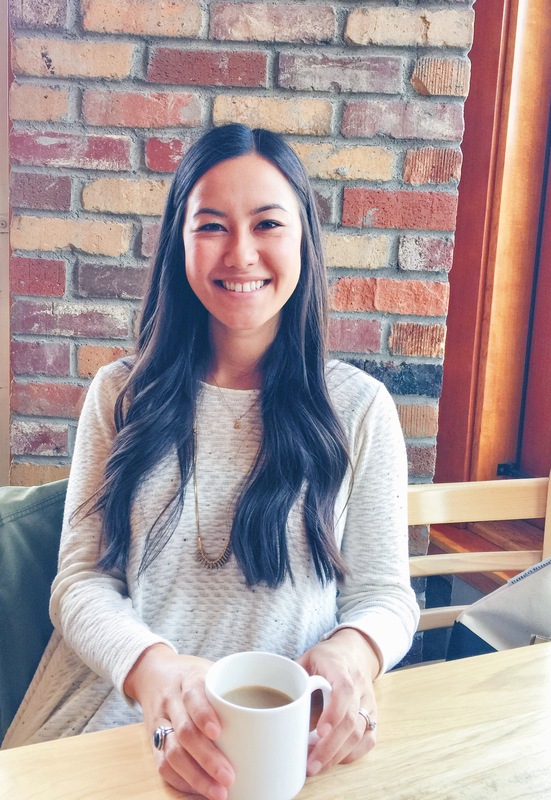 If you love Sriracha you'll love this sweet and spicy combo! In a mixing bowl combine the egg yolks, mayonnaise, brown sugar and sriracha – mix together until fully combined. Fill each egg white half with a spoonful of the mixture and garnish with carrot sticks. Chill until it’s time to serve. If you follow me on Instagram I shared a sneak peek of a Black Bottom Cream Pie over the weekend that I’ll be sharing the recipe for later this week! Subscribe to email updates to make sure you don’t miss it – or follow along on Instagram or Pinterest! Thank you Sandra!! You’re too sweet!